Simply create melodic rhythms on the inclusive musical instrument Piper. 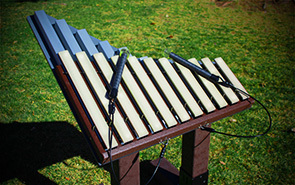 This compact, 11 note marimba is fluidly designed to resonate smooth, harmonic sounds like the full-size Imbarimba utilizing aluminum and fiberglass components. Precisely manufactured for all abilities and extensive, high-volume use, Piper is strategically crafted with fiberglass coated note bars backed by anodized aluminum resonators and a supportive HDPE frame. 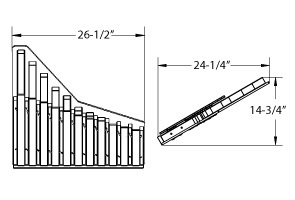 Ensembles instruments are specifically configured for portable, in-ground or surface mount installation, the recycled plastic and steel post mounts are factory cut for Adult or Toddler 'Finish Height'. The in-ground mount posts are ready for subgrade installations with 36" length for 'Frost Depth'. Actual Post Length = Finish Height + Frost Depth. Recycled plastic post can be easily cut to custom height in the field. Inviting and weather-resistant, Piper's easy to use design, encourages users of any age, ability or musical training to experiment, explore and create always in tune music—perfect for outdoor settings, playgrounds or community centers.